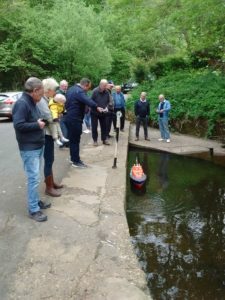 SAMS Shedders gathered to watch Mick’s lifeboat being launched on the beck and to play with the controls. Brilliant fun for all. Two youngsters staying locally had a go but steered it into the bank at speed causing the cockpit to jettison. 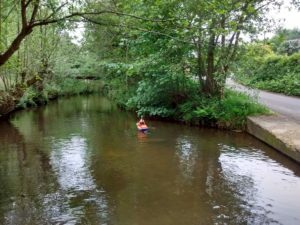 John Weeks rowed to the rescue and retrieved the bits! Brian and Graham cleared two cabinets in a storeroom at Eskmouth Scout Hall. The cabinets will be on their way to Staithes on Bank Holiday Monday morning. 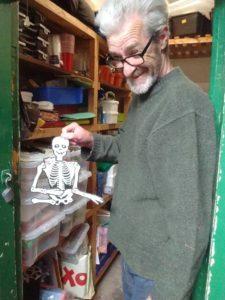 .However Brian made a grisly discovery of a skeleton in the cupboard. We don’t think it was a late Beaver, Cub or Scout though it seemed to have a smile on its skull. Bob was locking up on Thursday when there was a knock on the door. 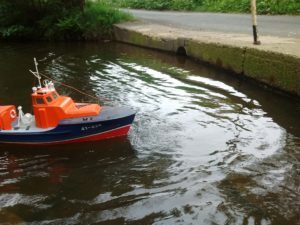 It was a gent from Lincolnshire who had read about SAMS in the Yorkshire Post article last year and had determined to come to Littlebeck to see for himself. It turns out that he has a museum of engineering equipment of all sorts (including lathes) that is housed in a disused hospital. We are invited to visit.